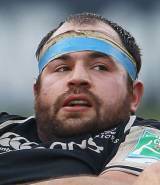 Ed Kalman joined Glasgow from the Reivers after the closure of the Borders pro-team and the prop signed a new deal with the Warriors in 2011.He was at tight head in the Cambridge team who beat Oxford in the 2005 University match at Twickenham. He joined the Borders in summer 2006 and his competition debut for Reivers was a replacement against Connacht at Netherdale on the opening day of the 2006-2007 Magners League, and he had his first start the following month in the victory against another Irish province, Leinster, also at Netherdale. His first Reivers try was in the Heineken Cup victory against Overmach Parma at Netherdale in October 2006. Ed made his first appearance in a national context as a replacement for Scotland A against their Australian counterparts at McDiarmid Park, Perth, in November 2006. He also had a replacement role in the A international victory against Italy on the same ground three months later. And he was called up to the 2012 Six Nations squad after an injury to Moray Low.